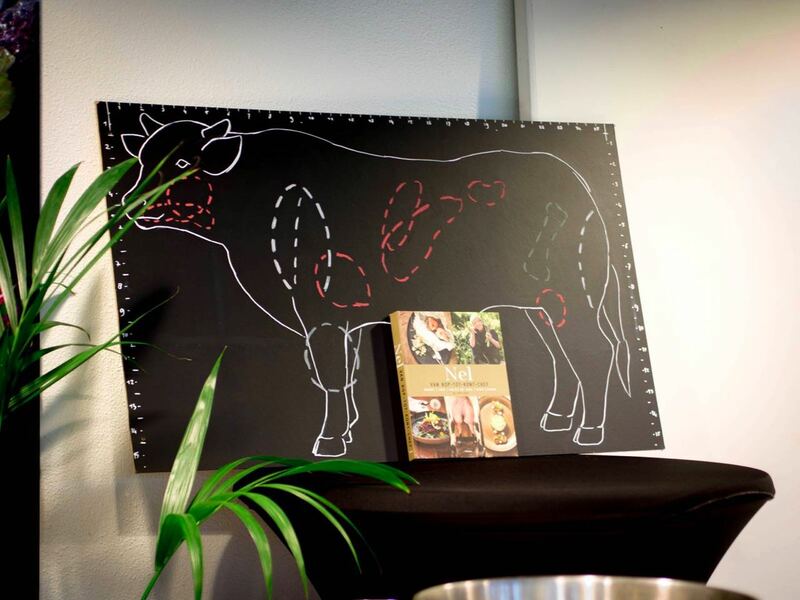 As part of earning our commis chef degree our class took on a ‘circle of life’ project, where we adopted a newborn bull calf from a dairy farm at the start of the year and at the end had to prepare a five course meal from it for >80 people. 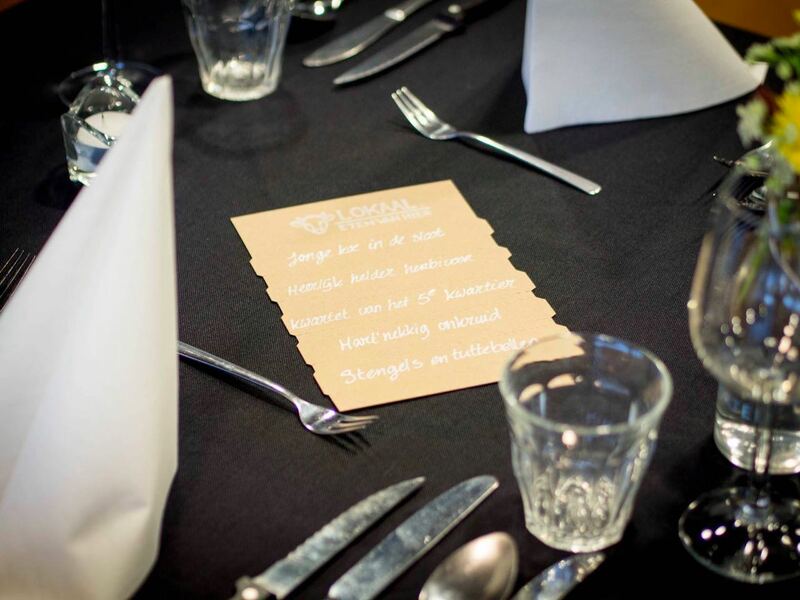 For this project I created all the branding, our special ‘tear-off’ menus and several large decor pieces. 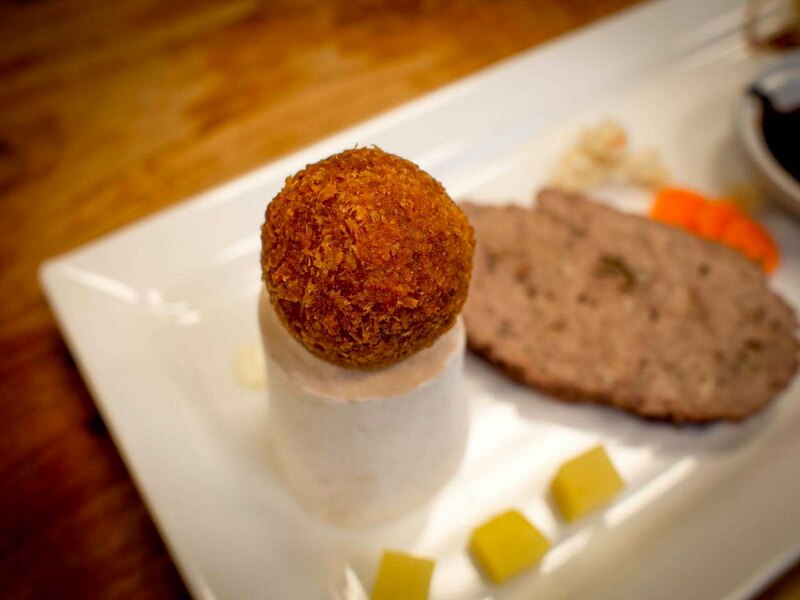 I also was the chef in charge of a tasting dish from our calf’s organ meats which is described in another post. 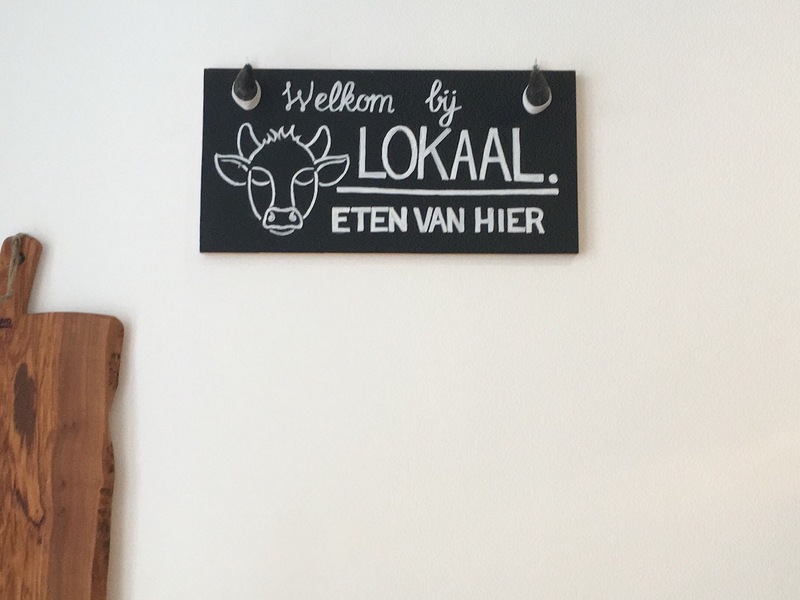 We named our pop-up restaurant ‘Lokaal’ as a wordplay: In Dutch ‘Lokaal’ is both an adjective meaning ‘locally’ as well as a noun meaning ‘classroom’. We were pretty happy with our choice since we made it a point to use locally sourced ingredients as much as possible and the location for our one day pop-up restaurant would be our actual classroom! 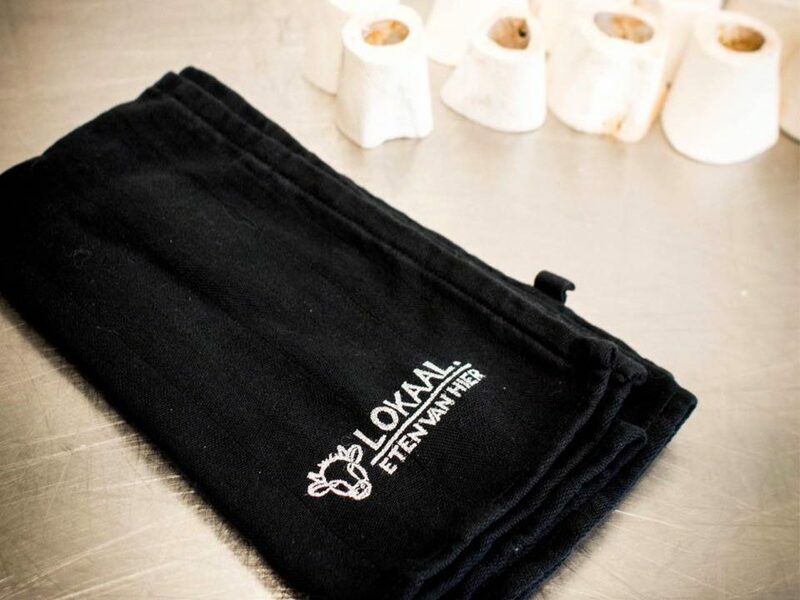 For ‘Lokaal’ I created our logo, our invitation, our sign (the horns on it are the actual horns from our calf), the serving towels, a diagram showing the different parts of the calf included in de menu,cleaned the bones we used to keep the little round croquettes from rolling of the plates, and designed and created our special ‘tear-off’ menus. 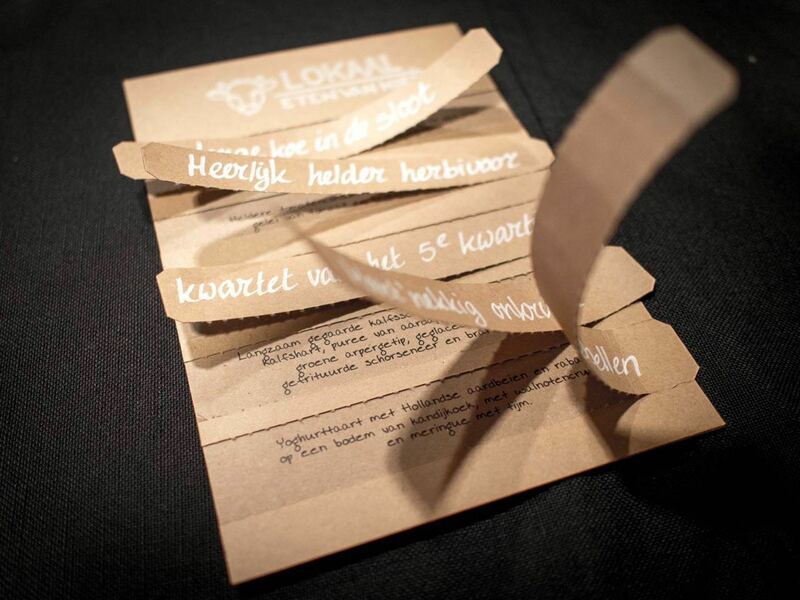 We wanted our guests to be able to read the ingredients for each course as it was being served but not read the whole menu up front. We wanted to intrigue them with the names we picked for the different courses so that only after a specific course was being served and the chef had introduced it, the guests would be able to read the ingredients on the menu. To achieve this I created the menu in two parts; made tear-off strips and glued the pieces on top of each other. 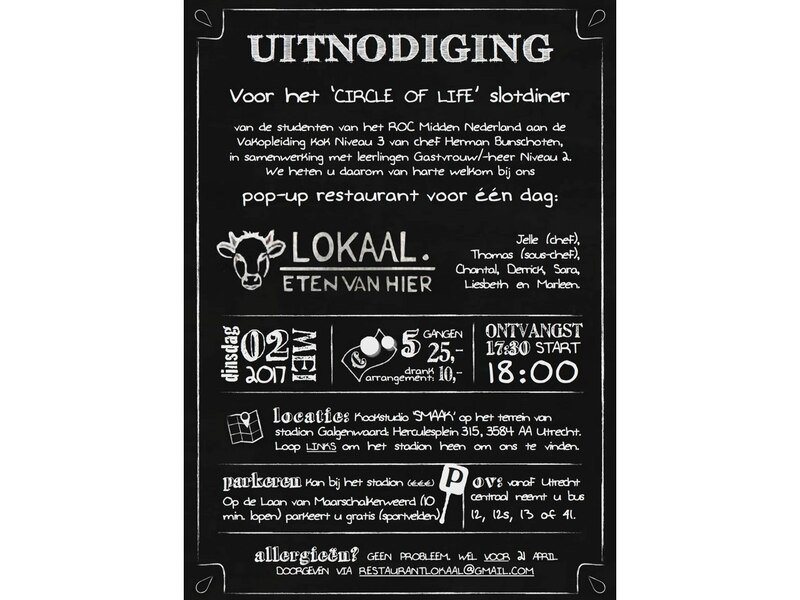 The small text was printed in black, while our logo was stamped with white ink and the titles of the different courses were handwritten.